I don’t like wrapping presents. Not only can’t I fold perfect corners, but I can’t help but feel it is a waste of paper, especially for a large present. Sure children delight in tearing it to pieces, and I have tried saving it, but let’s admit it…wrapping paper is a single-use product like a plastic bag. There are a lot of great alternatives to paper wrapping. Reusable shopping bags, like [amazon_link id=”B00559TTLW” target=”_blank” ]ChicoBag [/amazon_link], are great, but really, how many shopping bags does one person need. I already have them coming out my ears. Fabric is also a great alternative, but it is more expensive, and you have to be a quilter to really put those scraps to use. 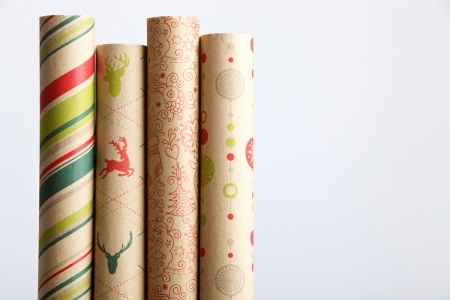 Did you know that many types of wrapping paper are not recyclable? The Cascades Boutique team decided to fix this situation by coming out with 100% recycled fibre wrapping paper. It is one of the only industrial packaging papers made in Canada! In addition to being recyclable, the paper comes in various designs and colours. In order to make this product greener, the paper is rolled without using a cardboard core. Therefore, the roll appears smaller than the standard roll. However, since 10 metres of paper is provided, it means you can wrap many gifts from the same economical format roll. I really like this paper, and it is way more affordable than other recycled gift paper I have seen. Four rolls for $12 is a great deal, and the rolls contain a lot of paper. Plus, I love that they are missing those cardboard tubes in the middle. Way to go Cascades! Would I buy this product? Yes! « Hold the Tylenol: Does Acetaminophen Cause Childhood Asthma?